As most world ethnic cuisines tell us, cooking proteins with the bones and shells still attached imparts flavor. Flavor, the all important factor in appetite satiation, drives our sense of abundance and satisfaction with our intake of nutrients and pleasure. Slicing the shrimp in half length wise with the shells still on allows you to clean the vein from the shrimp and season the cut side of the meat. Grilling them shell side down promotes maximum flavor. The grilling shell flavors the flesh with its sweet and musky piquant fragrance. In pondering how to apply a fine lime zest evenly to the raw shrimp without waste, I realized that drying it would allow ease of sprinkling. To do this I mixed it with fine sea salt and finely ground white pepper. The resulting spice seasoning adds the right balance of brightness, tang and zing needed to make this a thoroughly scrumptious entree or appetizer. The secret to easily cutting the shrimp in half lengthwise with a neat and clean look, is using a pair of scissors to cut down the back center line of the shell and the tail. Then, laying the shrimp down on its side, use a very sharp knife to cut the flesh into halves. You’ll get the hang of it with one or two tries. 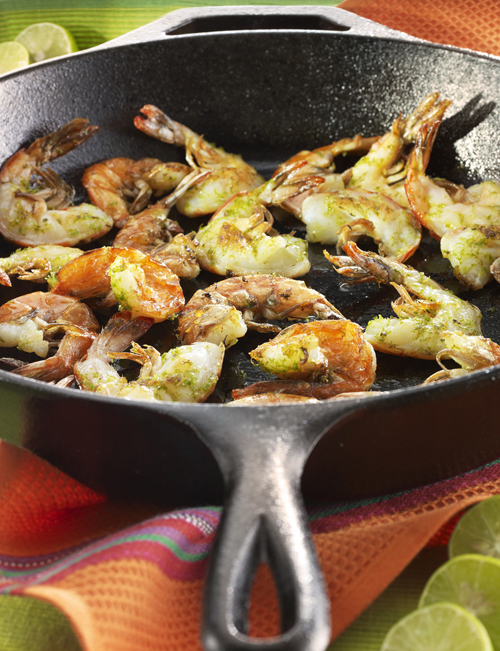 A half pound of shrimp will feed two people, 120 calories per person without the oil. Coconut oil adds 120 calories per tablespoon to the total pan, much of which gets left in the pan. Pull out the veins if you wish to. I find that sometimes they are less apparent than others. Add the shrimp halves to the pan shell side down, keeping track of the order in which you place them down. I have found that usually by the time I have put the last one into the pan it is time to turn the first one. Cook the shrimp until they just lose their translucency and remove immediately to a plate. It will only be about a minute. Do Not Over Cook or they will become dry and tough. It is easy to remove the shell while eating them with a knife and fork, but feel free to eat them with your hands.